2200 Student Union| Open Monday - Friday | 8 a.m. - 5 p.m.
On behalf of our Bearcat Food Pantry Committee, we thank the many generous contributors to our Food Pantry. We could not operate without your support! Thank you for recognizing the Food Pantry as an important component of our campus. 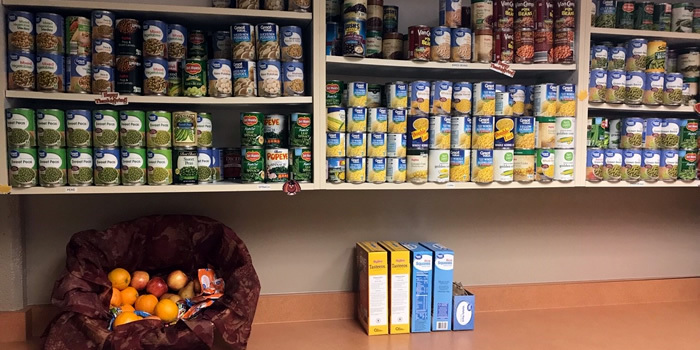 In the pursuit of equity and accessibility for all students and employees, the Bearcat Food Pantry will provide a source of food and necessities for Northwest students and employees. The target audience is individuals who are experiencing food insecurity and hunger. By providing a food pantry our goal is to help students and employees be successful. The food pantry, located in the J.W. Jones Student Union, Room 2200, is accessible from 8 a.m. to 5 p.m. Monday through Friday. We ONLY offer non-perishable foods. Items include canned, boxed and commercially packaged items that are in store-quality condition and are not out dated. It also includes items such as canned fruits and vegetables, boxed macaroni and cheese, and packaged goods such as ramen noodles. We offer personal hygiene items, including soap, shampoo, toilet tissue, feminine products and toothpaste. These are store-quality unopened packages. Students and employees must have a 919 number to shop. Northwest accepts food donations for the pantry at the Student Engagement Center and the Office of Student Affairs in the Student Union. Monetary donations to support the food pantry should be directed to the Northwest Foundation and are tax deductible (Please specify the Pay-It-Forward Fund or the Bearcat Food Pantry).